The Wall Street Journal reports that scientists have identified a new syndrome: Pedestrian Aggressiveness Syndrome, also known as Sidewalk Rage, the eco-friendlier cousin to Road Rage. Symptoms include muttering at other pedestrians, making insulting gestures (I’m not making this up–see the other 12 traits of P.A.S. here), and walking much faster than other people. As humorists everywhere scramble to identify other Rage Syndromes (soon to come: Dance Floor Rage, Bathroom Line Rage, and Cosmetic Counter Rage), I’m knee-deep in Snow Rage. Here in the Midwest, we’re all darned sick of snow. We want to store our shovels, behead our neighbor’s snowman family, wear flip-flops. Even with unseasonably warm temperatures that melt the snow from lawns and roofs, we feel only mild relief. We know the snow is coming back. It’s only February, after all. 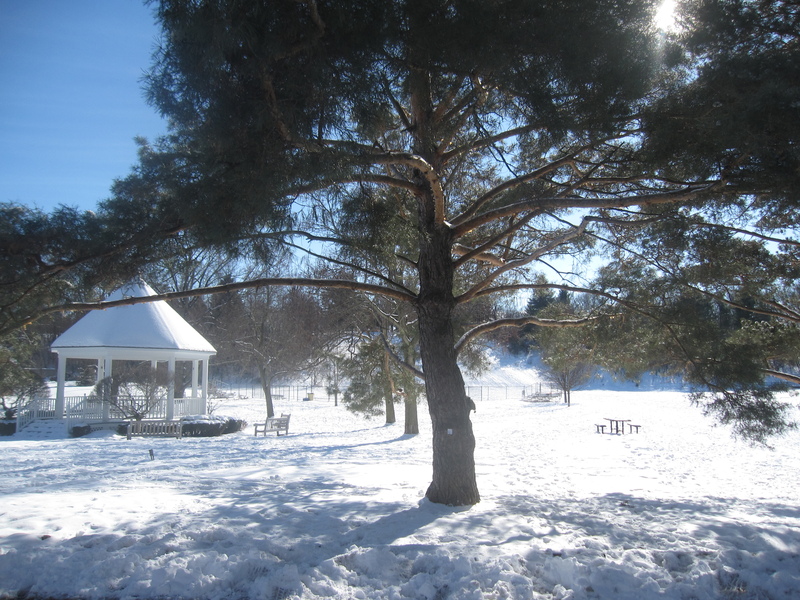 When snow does return, try to remember early December (pardon me while I channel The Fantastiks) when snow was young and oh so lovely. Or re-read the last paragraph of James Joyce’s “The Dead” and let the snow falling faintly and faintly falling refresh your outlook. Or even better, recite “Dust of Snow” till you’ve memorized it, and carry it around in your head for protection against S.R. On my first few reads of this poem, I thought the rhyme and meter were a little heavy-handed, nearly taking over. “Dust of Snow” is so sing-song that it sounds like a misconceived entry at a cheerleading competition. And in last place, all the way from New Hampshire, the Robert Frost Middle School Squad! But not a word is forced for the sake of rhyme or meter, and the central image is expressed so elegantly that the poem becomes meditative, haiku-like. 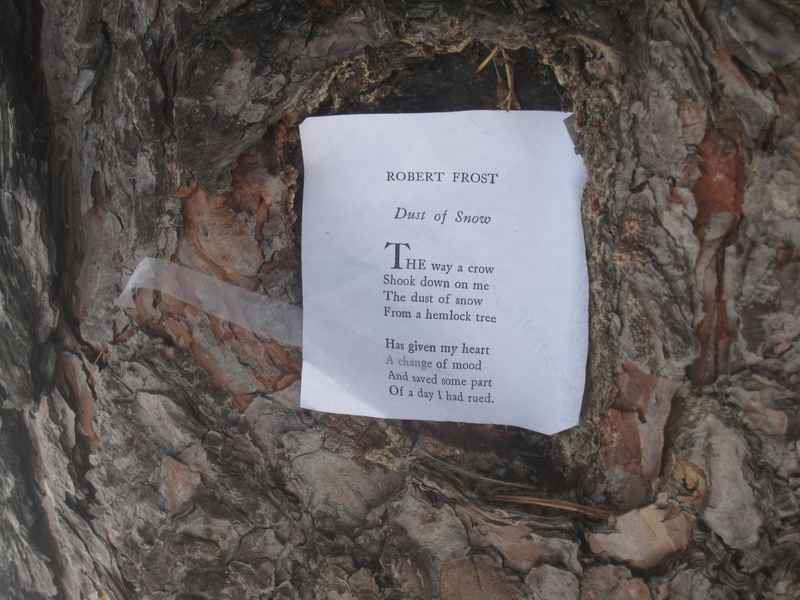 Robert Frost (1874-1963) was arguably America’s most beloved poet, four-time winner of the Pulitzer Prize, celebrated teacher at Middlebury College, and unofficial poet laureate of the United States, earning the previously unknown privilege of reading a poem at a presidential inauguration. I’ve always thought of him as a Burl Ives’ kind of guy, avuncular and cheerful, growing apples in New England and writing sweet little nature poems. But Frost lived through his share of darkness: the early loss of his father, the deaths of four of his six children, and his own depression. He seems to have had a difficult personality and he wasn’t much of a farmer either. And his poems, sweet though they may seem because of the traditional rhyme, are grounded by a dark spirit. In the simplest of language, without a single adjective of adverb, Frost captures the beauty of the New England winter landscape and his own loneliness. We see the black crow, the white snow, the green of the hemlock, and the solitary poet. Then in the stillness and silence, the crow plays a little joke. He drops snow on Frost. The poet is jolted out of his sadness, renewed by encounter. Just a few words, a little movement, and whoosh! everything’s better, at least temporarily. For all the renewal of mood, the poem still ends on a dark note, a day I had rued. I have my own mood-lifting hemlock tree experience. Once I saw a sweet old fellow in my neighborhood, a man with a loping stride who walks for hours everyday, stop by a hemlock tree whose branches hung from a neighbor’s lawn deep into the street. He pulled a needle off a branch and put it in his mouth. I caught up to him. “Did you really just eat something off that tree?” I asked. Like Frost’s dust of snow, that pine needle lightened my day.